DESCRIPTION: Amazing new construction. 9,830 sqft + 3 Rm Det. GH on huge flat lot. 2-story foyer w/skylight. 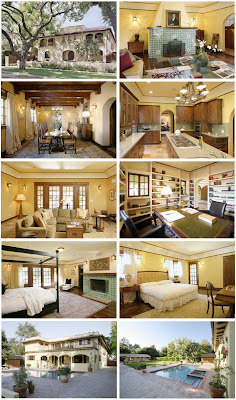 Hi-clngs, hwd/Saltillo tile flrs, iron lighting fixtures, authentic tile accents. LR w/fp. FDR. Family, Media Rm, Lib. Granite/stainless kit. Breakfast Rm. Wine Rm. YOUR MAMAS NOTES: Some time back Your Mama discussed Joely Fisher and Chris Duddy's Indo-Asian freak out in Encino that the couple still have on the market for $4,295,000 (reduced from $4,750,000). This last weekend celebrity real estate doyenne Ruth Ryon at the LA Times announced that the couple have purchased a new house, this time a huge, newly built Mediterranean manse in Sherman Oaks. That report was followed up by a nice write up by Mister Big Time. Well sort of followed up. Seems Mister Big Time broke Miz Ryon's story online before it was actually available in print to all but Angelenos who are able to buy the Sunday paper on Saturday. So anyhoo, we're following up the very rear on this one, but since we like Miz Joely and her behemoth breasts so much we figured we'd weigh in with a few thoughts. We have some issues with the exterior. The front looks a little too much like an apartment building in downtown Santa Barbara, and we are absolutely hateful about its too close proximity to the street. Given that her last house was so impressively and wonderfully private, we actually find it sorta strange that Miz Fisher would even choose a house with this sort of street fronting. At the back of the house we have what looks to be a big square generic McMansion with unattractive articulation and window placement. As for the swimming pool? Well it fits with the Santa Barbara apartment building motif. Also, please note, that in order to get a car out of the garage and onto the street, one has to back down the driveway right next to the swimming pool. One wrong move or minor distraction and you've backed the Mercedes into the pool. As for the inside, well we do like the long dining room with the high beamed ceiling and the master bedroom looks like a cozy retreat. We also like the repetition of the green tile on the fireplace surrounds. But beyond that we're feeling rather blasé about the house. The assessor lists the house at 7,807 square feet while the listing shows 9,830 square feet. We assume, rightly or wrongly, that the extra square footage is comprised of the large guest house at the back of the property. Inside the big house there are 7 bedrooms and 7.5 bathrooms which means it's just a good damn thing that there is also a three room staff suite, because with all that excessive square footage and 8 terlits, a live in maid is a requirement. We expect that this house and grounds will soon be filled with statues of the Buddha and Vishnu and there will be a slew of brightly colored pillows covered in sari fabrics strewn all over the house. All the best to the Fisher/Duddy's in their new, strangely unremarkable home. Totally agree with you on the home's exterior Mama. Forget the trend of putting a modern twist on classic architecture, especially on larger McMansions which only serves to accentuate and amplify the problem. Build classic, or go modern, but don't blur the lines. I absolutely couldn't live with the driveway running alongside the pool to within a few feet of it. I'd always be concerned about running someone over who was out using it on my way driving in. There's no way I'd trade the home Joely is trying to sell for this one. that is one ugly house from the outside and the pool proximity to the drive is too uncomfortable looking, notice the pool stairs are next to the drive also. Could that be breaking a few building codes? weird. "One wrong move or minor distraction and you've backed the Mercedes into the pool." - my favorite line mama. there is nothing worse than the sl65 totally submerged! Now, I love some soft yellow walls in my house but the decorator has gone overboard with the yellow and it's not even a very pretty shade. Not at all lovin' the tile around the fireplaces and in the kitchen. It's almost the dreaded 1970s avacado color (which I loathe) and is totally out of place on the fireplaces. I don't mind the exterior too much. Yes, it's a bit apartment-ish but rather pretty none the less. One other thing; if this were my house, I'd have some Bougainvillea vines (or tiny, climbing roses) trained over the oval entryway and I would definitely have some flowers and vines spilling over the upstairs window "boxes", grates...whatever. I think that would go a long way in softening the look. could make that side of the pool a graduated slope & market it as a pool/carwash. LOL + OMG Anon @ 10:53 AM! I am sooo lucky I wasn't sipping on something when I read that, LOL. The library needs some real books. I could fill it. I con't see Joely as much of a reader, though.